Requiring us to be both graphic and industrial designer, we worked within a tight knit team. We started by creating a range of bottle shapes that would underpin the brand heritage of Berocca, while working with the unique tablet release twist top that was the heart of the production innovation. 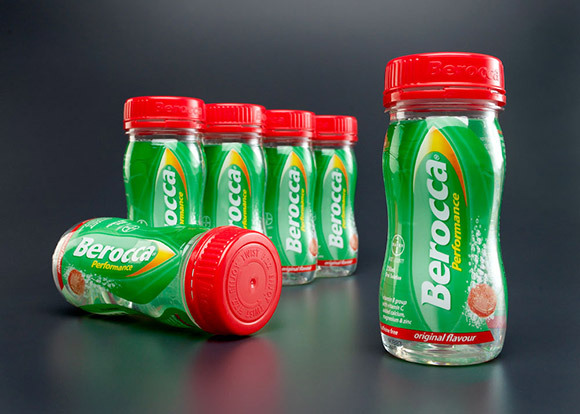 Then we evolved graphics for the innovative shrink wrap embracing the bottle which would speak volumes about the new product, as well as reassuring consumers of the brand promise of Berocca. It was a journey, not without its own bounces along the way due to the complexity of the innovation and requiring innumerable design tweaks. But when the product hit the shelves, it also hit the sales forecasts.